A super-sweet and romantic hand lettered Valentine's card. 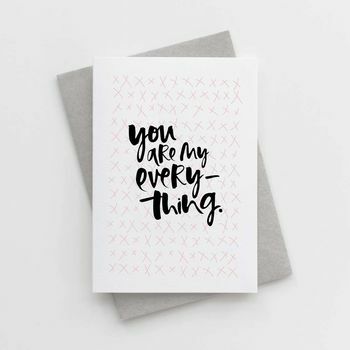 This beautifully simple card is designed with a sweet message making it the perfect card to give to your favourite human this Valentine's Day. With a background made up of soft, blush hand drawn, kisses and our signature lettering reading 'You Are My Everything', this design is the perfect choice this Valentine's Day. Alternatively, this card would be the perfect choice for a newly engaged couple, a special anniversary or given to your other half on the morning of your wedding.